While they are both degenerative eye diseases, glaucoma and cataract are different. Here we provide you with an overview of glaucoma vs. cataract. Well over two million Americans currently suffer from glaucoma, and by the age of 80, over half of those living in the U.S experience cataract. What is the difference between glaucoma and cataracts? Glaucoma is an eye disorder that damages the optic nerve that carries information from the eye to the brain. In most cases, it relates to high pressure inside the eye. This is called “ocular hypertension.” It is important to know that there are some situations where intraocular pressure is normal, yet a person still gets glaucoma. Like glaucoma, cataracts are part of the aging process, but this eye condition is different from glaucoma. A cataract is actually a clouding of the clear lens of your eye. Think of it as looking through a fogged-up car window. A foggy eye lens can make it very difficult to read and carry out other daily tasks that require good sight. Sadly, most people notice glaucoma symptoms when the disease has progressed and they have irreversible vision loss. Cataract symptoms develop slowly, but over time, they start to impact vision. Let’s look at some key differences of glaucoma vs. cataract. The optic nerve is made up of over one million nerve fibers. These fibers connect the retina to the brain. The retina is the tissue located at the back of the eye. When the optic nerve is damaged, there is no communication between the eye and the brain and you suffer from glaucoma. Early detection is important if you want to limit vision loss. On the other hand, cataracts are all about lenses. The lenses in our eyes are made up of protein, yet over time, this protein can clump up and reduce the light that is able to pass through the eyes. Years of research has told us that cataracts are due to aging, but glaucoma is sometimes related to aging and sometimes it isn’t. There are some people, including those with a family history of glaucoma who are at a higher risk of getting the eye disease; however, when it comes to cataracts, the overriding issue is age. Right now there is no known cure for glaucoma, but cataract treatment can help restore vision. For easy reference, see the summary comparison for glaucoma vs. cataract below. You now know that glaucoma damages the optic nerve, but you are likely wondering just how this happens. It is due to high fluid pressure in the eye. It can happen when the liquid in the front of the eye does not circulate the way it should. Usually, the eye fluid flows out of the eye through a mesh channel; however, if this channel gets blocked for some reason, the liquid builds up. As damage to the nerve progresses due to the pressure, you can start to lose your sight. Glaucoma causes can be inherited as we mentioned earlier. There are also less common causes, such as eye trauma or a chemical injury, severe eye infection, blocked blood vessels, as well as inflammatory conditions. In rare cases, eye surgery to address another condition can cause glaucoma. While we don’t exactly know why pressure builds up in some individual’s eyes, there are factors that may play a part in the disease, including those listed below. Most people who get glaucoma are over the age of 40, but it is not unheard of for children to get it. Research shows that African-Americans tend to get glaucoma more often when they are young. We have already stated that a family history is one of the glaucoma risk factors, but so is having generally poor vision, diabetes, eye trauma, or taking steroid medications on a regular basis. When it comes to cataract causes, we have to think about the aging process. The lens in our eyes is made up of water and protein that helps us to see clearly, but when protein clumps together the clump can grow over time, clouding vision. We don’t know for certain why our eye’s lens changes, as we get older; however, researchers have been able to pinpoint some cataract risk factors, as outlined here. Some recent nutrition studies have suggested cataract causes may be linked to oxidative changes in the eye lens. As it turns out, some research shows that fruits and vegetables that are high in antioxidants may help prevent some cataracts. If you have a family history of eye disease or know someone who is complaining about an eye problem, then you might be asking the question: What are the symptoms of cataracts and glaucoma? When many people have glaucoma, they don’t notice any symptoms but the first sign is often a loss of peripheral vision (side vision). It can be easy to miss and is the reason you should have a full eye exam every one to two years. There are situations where people experience severe eye pressure levels. This can be accompanied by eye pain, headache, blurred vision, or the appearance of halos around lights. If you experience any of the following signs and symptoms, you should see a doctor right away. Cataracts can take years to develop and at first may only impact a small part of the eye’s lens. As the cataract grows larger, it distorts light that passes through the lens and symptoms begin to appear. The list below covers the most common cataract symptoms. If you experience inflammation, headaches, and pain, it could be what is called a hypermature cataract, which requires removal. How Are Both the Eye Conditions Diagnosed? A glaucoma diagnosis begins with a thorough eye examination. The eyes will be checked for any signs of nerve tissue loss. The doctor will want to know about any family history of eye disorders, as well as what symptoms you have experienced. 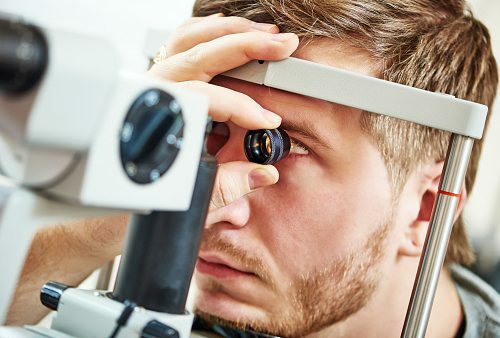 Usually, a general health assessment will take place to determine if any underlying health conditions could be contributing to the state of your eye health. Essentially, doctors are looking for factors like high blood pressure and diabetes. The following procedures may also be involved in a glaucoma diagnosis. Pachymetry test – a measurement to determine if your corneas are thinner than average. Thin corneas can increase chances of developing glaucoma. Perimetry test – also called a “visual field test.” this measures your peripheral and central vision. Optic nerve monitoring – this means monitoring any gradual changes in the optic nerve by taking photographs of the nerve and comparing them over time. Cataract diagnosis also involves an eye exam, which includes testing your vision at different distances. A review of your medical history is also important. Like glaucoma, a tonometry test to measure eye pressure will be conducted. Below is a list of other cataract diagnostic procedures. Visual acuity test – this is an eye exam that uses a chart to measure how well you can read a series of letters. Slip-lamp test – this examination means the doctor will use a slit lamp to see the structures at the front of your eye. It is called slit lamp because it uses an intense line of light to illuminate the lens of the eye. Retinal exam – using a special device, the eye doctor can examine the back of your eyes (retina) for signs of cataract. What Are the Differences in Treatment Methods? Treatment methods for glaucoma and cataract are different. With glaucoma, the first goal of treatment is to reduce eye pressure so that eyesight doesn’t get worse. In the majority of cases, the doctor will suggest special eye drops for glaucoma treatment but it is important to use them as directed. Research indicates that blindness due to glaucoma is often associated with people not sticking with strict eye drop usage. Medications – there are various medications in the form of eye drops or pills. Some people are prescribed a combination of the two. Surgery – this can be used to make a drainage path for fluid or destroy tissue that is causing the increased fluid. Lasers – this type of procedure uses lasers to help lower intraocular pressure. Cataract treatment depends on what stage of cloudiness you experience. In mild cases, people are told to use stronger eyeglasses and wear sunglasses with an anti-glare coating. When cataracts prevent you from participating in normal daily activities, surgery is recommended. Cataract surgery is also suggested when the cataracts are interfering with treatment for other eye problems. There is two widely used surgical methods for cataracts: phacoemulsification and extracapsular surgery. Phacoemulsification uses ultrasound waves to break the lens apart and remove the pieces, while extracapsular means removing the cloudy part of the lens through a long incision in the cornea. Following this procedure, an artificial lens is placed where the natural lens once was. Surgical procedures to remove cataracts are generally safe and successful. Unfortunately, there are no known ways to prevent glaucoma, but significant vision loss can be prevented if you are diagnosed early. There are a number of ways you can try to avoid cataracts. For example, you can refrain from smoking, wear proper sunglasses when out in the sun, keep diabetes under control, avoid steroid use, and maintain a healthy diet. Even though we have described the difference between glaucoma and cataract, no matter what your eye health currently, you should be getting regular eye exams to rule out these or any other eye disorders since they can significantly impact your quality of life. Eye exams are painless and usually only take about 20 minutes.